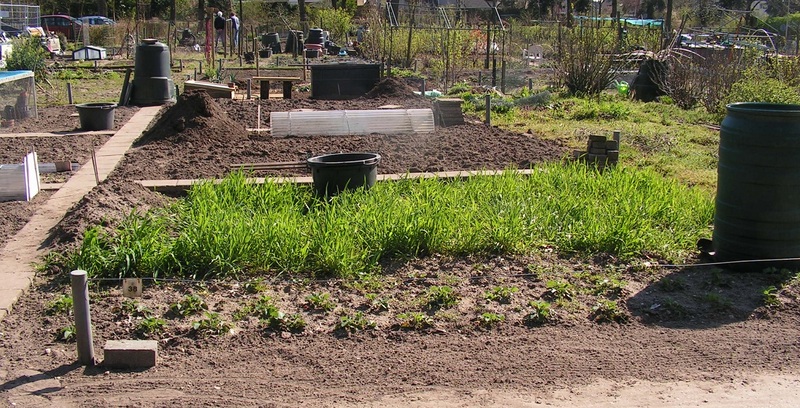 I hire a big allotment garden of 100 m2 (120 sq yard) in the east of The Netherlands. A central path and side-paths of paving stones divide the garden into 6 equal parts. In each part I grow different plants. In part 1 potatoes, in part 2 cabbage plants, in part 3 root vegetables etc. Next year I grow each vegetable one part further. After 6 years the vegetables grow in the same parts again. This is called crop rotation. Due to crop rotation there are less ground diseases. And the garden soil is not exhausted due to “always the same plants” . The soil in the garden consists of sand. 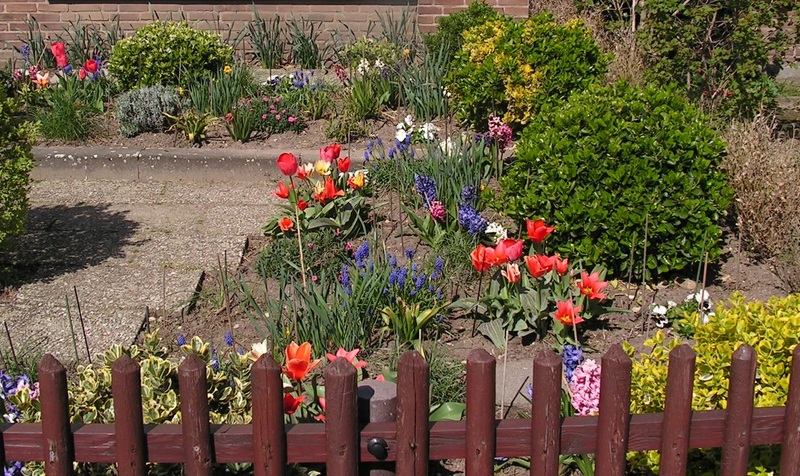 It is easy to work with spade, hoe or rake but plants need regular watering to grow. See photos below. 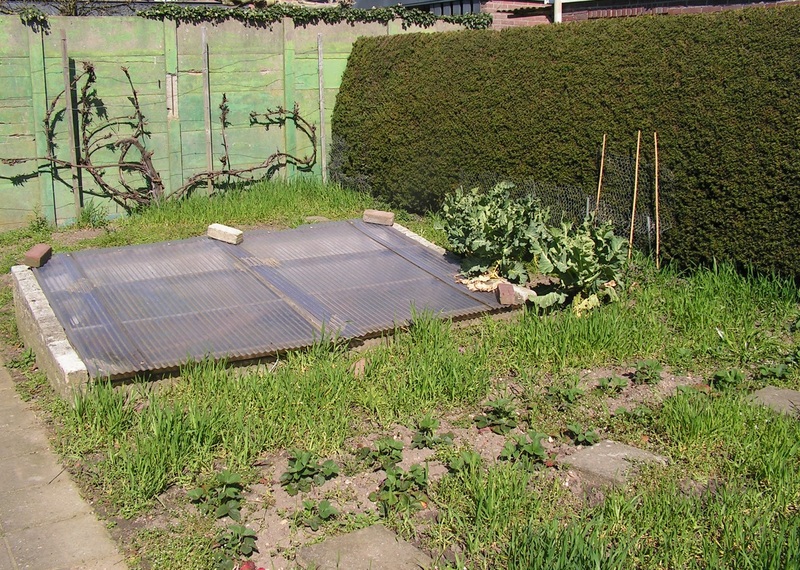 Behind my house I have also a vegetable garden of about 60 m2 (72 sq yard). I have sowed mixed cereals (chicken food) at empty pieces of soil in my allotment garden and backyard garden. The wheat seeds have turned into small wheat plants. You see the little green stems (leaves) on some photos below. The wheat plants prevent nutrients from washing out of the garden soil during heavy showers. 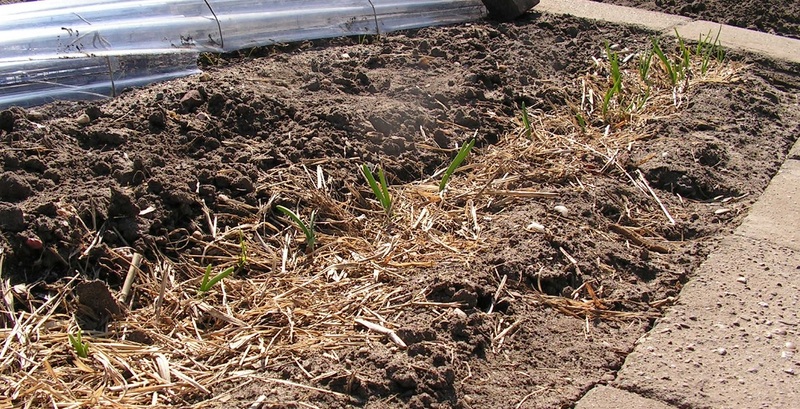 In spring the wheat plants are buried during digging the soil. This procedure is called “green manure”. 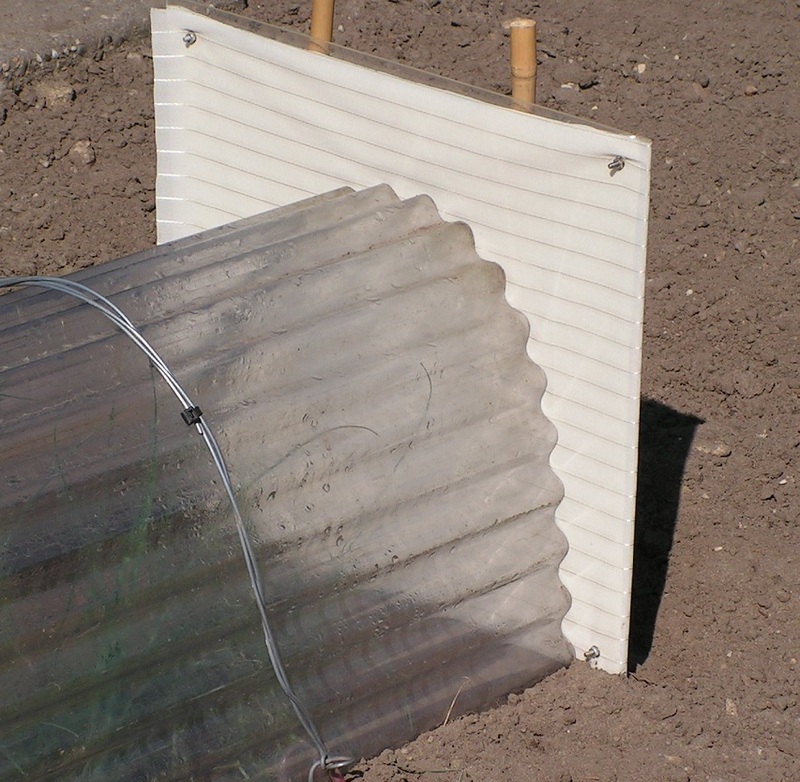 In the front part there is a greenhouse tunnel made of transparent corrugated plate. Under the tunnel and next to it there are many big and small lettuce plants. Close-up of big lettuce plants under the tunnel. In this part there are 2 endive plants, bought in a gardening shop. There are also thin leek plants under a tunnel greenhouse. These leeks have been grown indoors in “shove trays”. Blocks of planting soil with thin leeks have been shoved in (on) the garden soil. This tunnel has special end plates; flat pieces of perspex, each with an air opening. 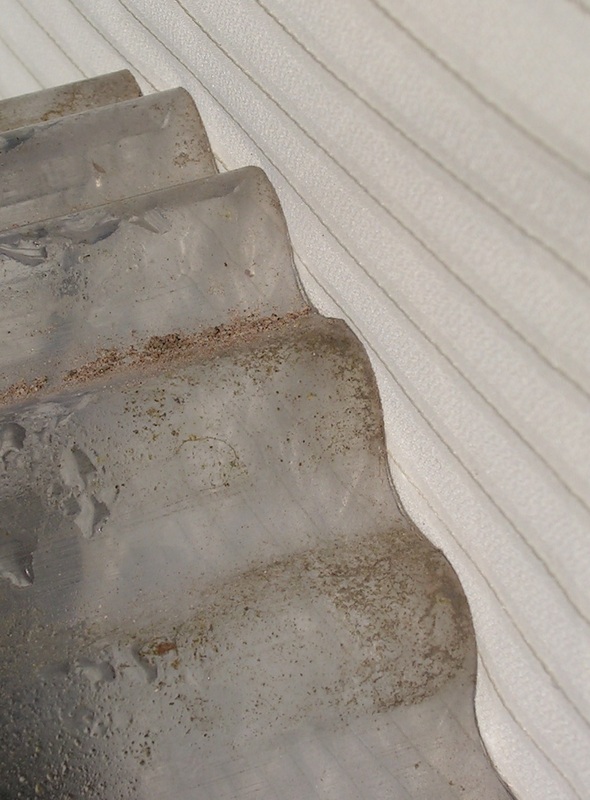 There is curtain material at both sides of the perspex plate, fixed with screws at the corners. Two thick bamboo sticks and tamped garden earth push each end plate against the tunnel. At the long sides of the tunnel (at the outer side), garden earth has been shoved aggainst the tunnel. This earth closes the tunnel at the long sides. The net curtain material has many tiny holes. The diameter of the holes is less than 0.3 millimeters (1/80 inch). The material is well air permeable; you can easily blow air through 2 layers of curtain material. Small insects, like miner flies or leek flies, can not pass this material. I got this curtain material from an acquaintance. Instead of this material, you can use other net curtain material with tiny holes. The curtain material is at both sides of the perspex plate. At the inner side the soft curtain material pushes against the hard, sharp edge of the bent corrugated plate. This forms very tiny openings between tunel and end plate. Onion flies or leaf miner flies cannot pass these tiny openings. This construction makes the tunnel very airy, but still impenetrable for leaf miner flies, leek flies and other small insects. Soon this info will also be in tip 4) Leaf miner flie. In the middle part there are onion plants and summer carrots. In front (next to the side-path) onion sets have been planted in a furrow on March 1, 2019. There is a layer of hay between the onions. 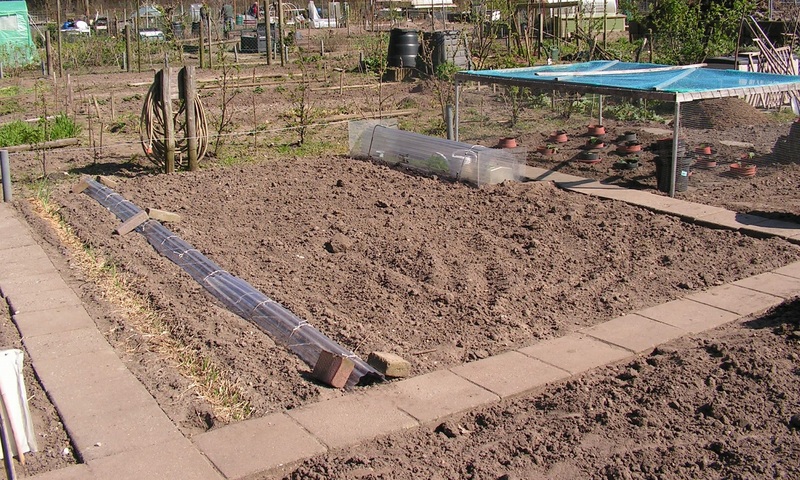 Some further, there is a row of mini onions (sown indoors and planted in the garden soil) in a furrow. Over the furrow there are transparent mini tunnels. 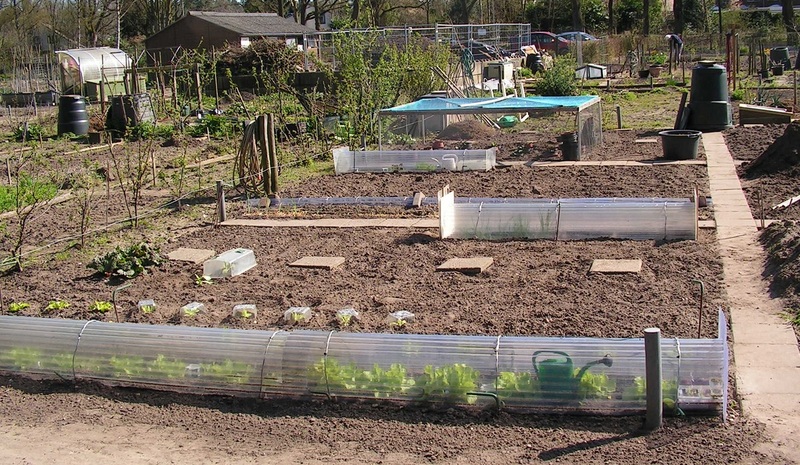 In the middle part (near the other side-path) there is a greenhouse tunnel with summer carrot plants. 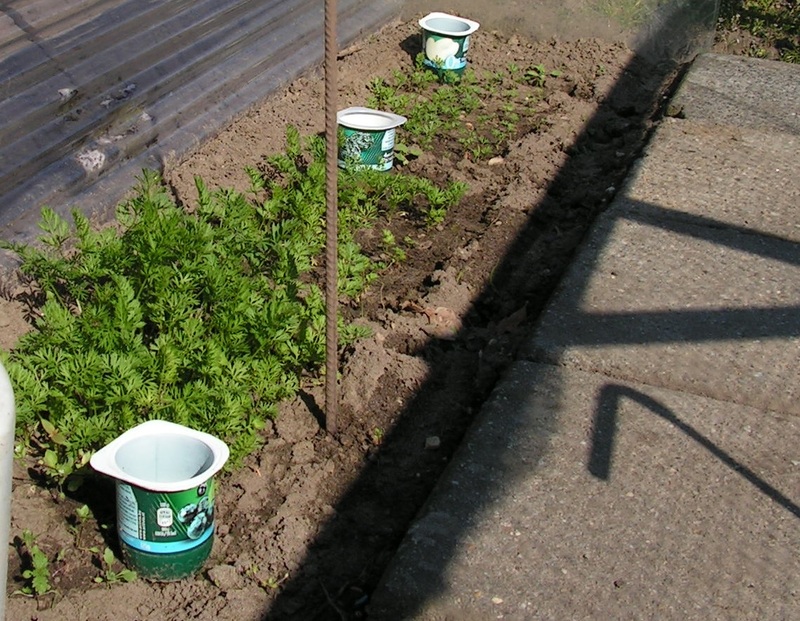 These carrot plants in front have been sown and replanted indoors. Later on, the plants have been shoved on/in the garden soil. See also tip 20 . The seeds of the other summer carrot plants have been sown on moist toilet paper. The mini carrot plants have been replanted in the garden soil. In the rear part, there is a cabbage cage with Cauliflower plants and Broccoli plants. 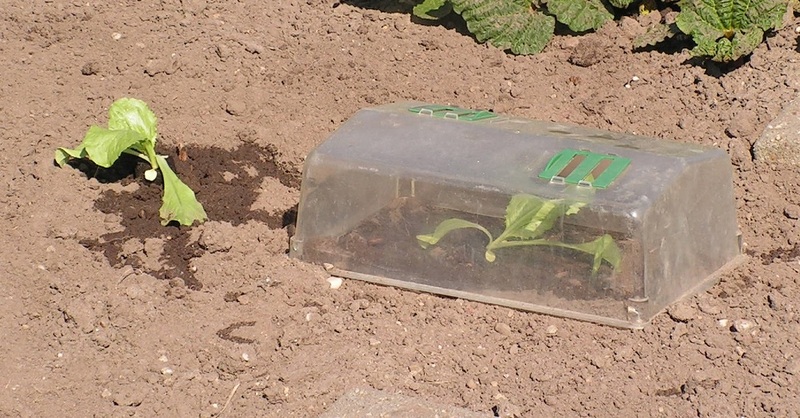 A cabbage cage protects the cabbage plants against the Cabbage White butterflies. They lay their eggs on the leaves of the cabbage plants. The eggs turn into caterpillors that eat much cabbage material. When using a cabbage cage this does not happen. Right rear there is a heap of cow manure. I’m going to make a roof of corrugated plate over this heap of manure, against leaching of nutrients during rainy weather. In the front part there are 3 rows of strawberry plants. The soil in this part needs to be spaded. In the middle part there will be leguminous vegetables (beans, peas). At the right side there is metal wire netting (rolled up) to grow peas. In front left there is a heap of compost. 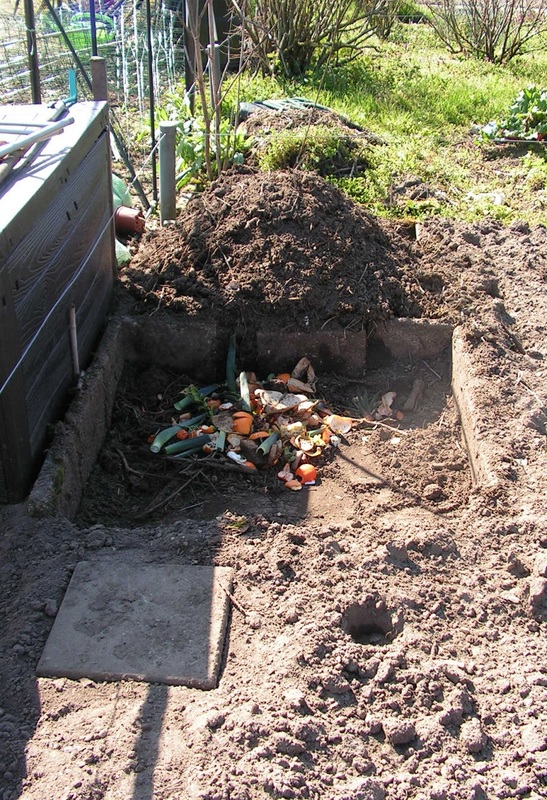 This compost is originating from my compost containers in the rear part of my garden. Under this tunnel there are 2 trays of pea plants in compost. The plants can grow bigger here. In one week, the pea plants will be planted in the garden soil against the wire netting. 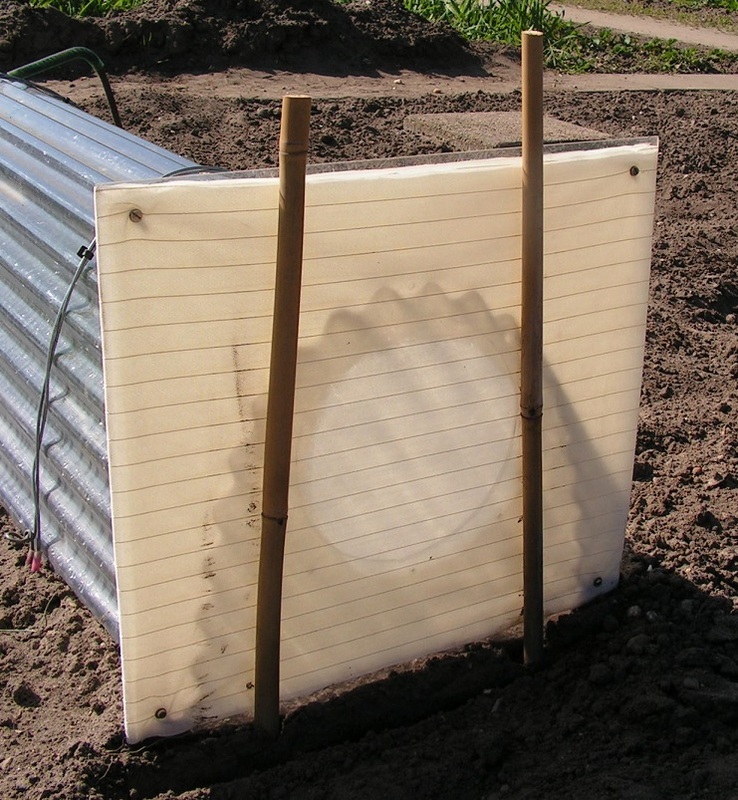 In the rear part, potatoes have been planted in round holes of 20 centimeters (8 inch) deep, made with a bulb planter. In each hole, one potato has been laid and a thin layer of garden earth has been strewd on the potatoe. 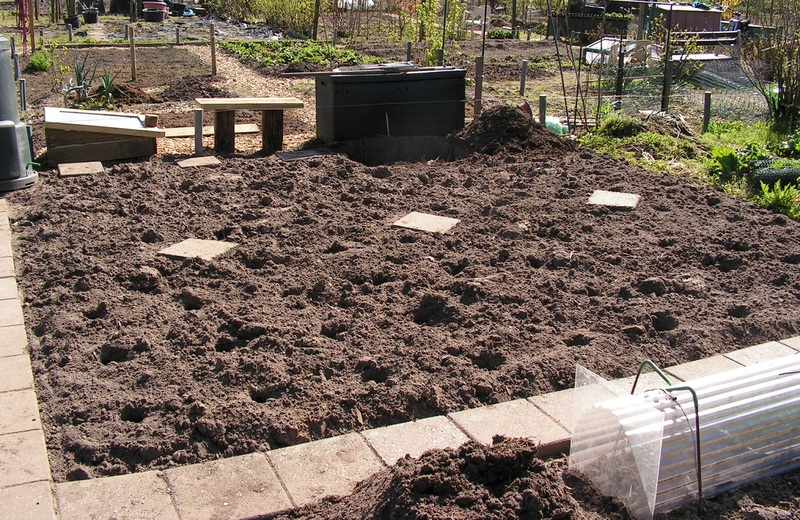 The photo shows the holes in the garden soil. Te potato plant can easily grow up due to the thin layer of garden earth on the potato. 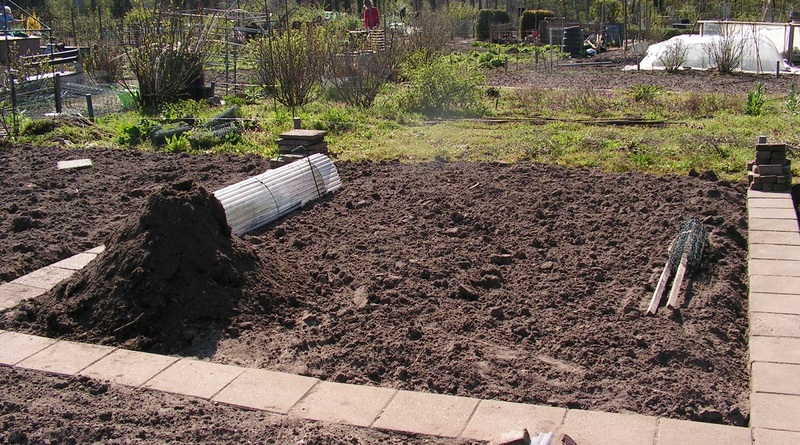 Before freezing weather, more garden earth is put in each hole to cover the leaves of the potato plant. In the corner of the rear part there are 2 compost containers, next to each other, made of square paving stones (30 centimeters, 12 inch). In the front container there is fresh plant material. In the rear container there is a heap of half converted compost. More info about these containers in tip 1. 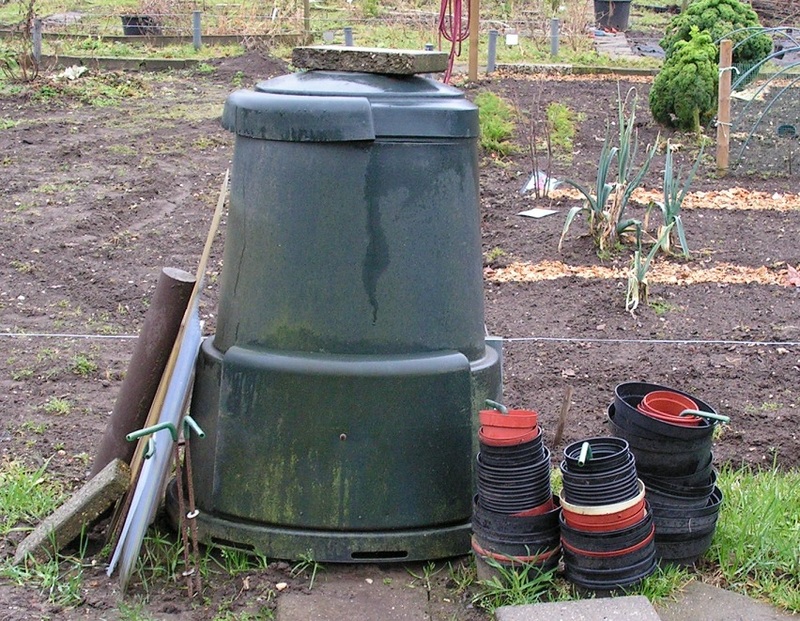 The green plastic compost container at the end of my garden is used as a tool storage (for a hoe, rake, spade etcetera). 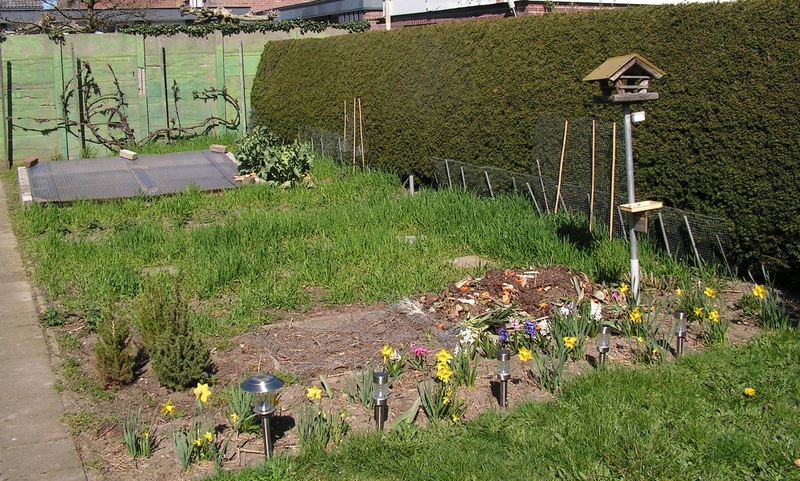 Photo of the backyard garden on April 1, 2019. 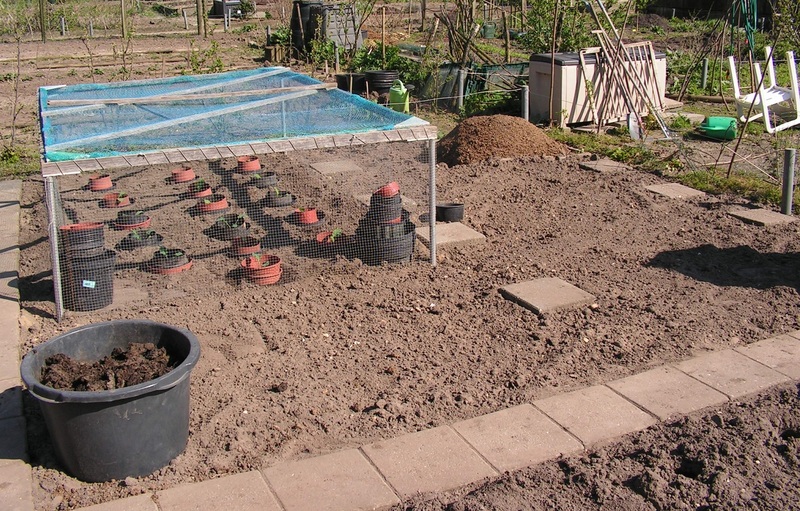 In the front area of the garden there are 2 compost containers (next to each other) made of paving stones. The right side container has fresh plant material. In the left side container there is compost. Futher in the garden there are 2 rows of strawberry plants. At the right side you see big winter cauliflower plants. In the garden there is a greenhouse made of white bricks. The soil level in the greenhouse is about 2 feet below the soil level in the garden. On top of the greenhouse there are transparent corrugated plates. In this greenhouse there are gardening things now (iron wire netting, laths, frames etcetera). Against the green fence there is a grape bush. In another corner there are 2 big cauliflower plants. And strawberry plants in compost in window box liners. New plants grow indoors before an attack window towards north (April 1, 2019). My biggest tomato plants (left side) and 2 of my biggest sweet pepper plants (right side). 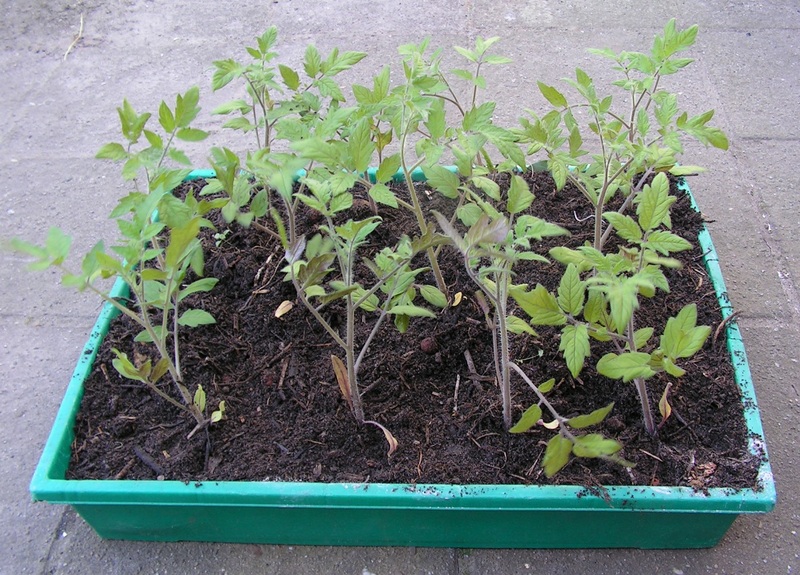 On April 1, 2019, the same big tomato plants in a tray with compost. On April 1, my biggest bean plants grown on moist kitchen paper. The biggest bean plants are put in flower pots with compost, 4 plants per pot. The front garden is towards south. On this photo a part of the front garden at April 1, 2019. The bamboo plant sticks in the soil prevent my neighbours cats from digging (and pooping) much in the garden soil. I like your garden. I am in Chicago, and I think it is colder here. Your tips are wonderful!! In a “normal” Dutch winter we have 30 to 40 days (nights) with temperatures between 0 and – 10 C.
Thank you for sharing your garden photos and tips! You’re welcome. I hope that the tips and photos will help you. Sjef, thanks for the informative site. If I wanted to grow Belgian endive on a large scale, would you recommend differently? I am in South Africa in the Overberg region. We have a winter rainfall (June to September) and hot dry summers ( December to February). Any further information would be greatly appreciated. For large scale growth of Belgian Endive you better search on the internet for information. I don’t know the details. Growing the plants (with green leaves) will be about the same as in my garden. But growing white heads in the dark (after cutting the foliage) will be different. I know that on a large scale the heads grow in the dark while the roots are in big containers with running water and nutrients. Sorry that’s all I know about this topic. Thank you for answering my comment. One more question? Would moles be a big problem for growing endive? My soil conditions would be perfect but now I do have moles. How can one work around this? Sorry I’m not a mole expert. In our allotment garden there are only few moles. I suggest to look on the internet for a solution (How to get rid of moles). Good luck with your blog. Beautiful photos in there. Hello Sjef, Thank you for a wonderful insight to your garden and tips. Very interesting and informative. I’m wondering why your tomatoes are grown in pots, in the garden. You’re welcome and thanks for the complement. 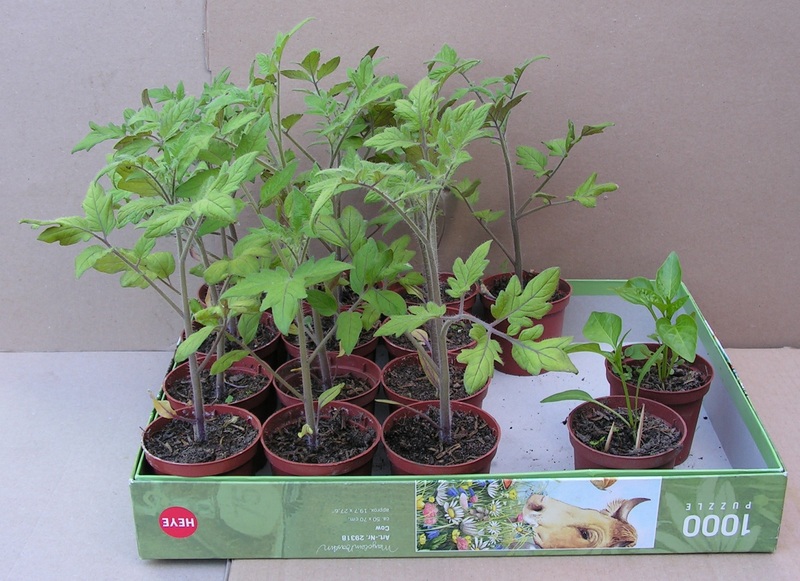 About het tomatoes; all plants grow in the garden soil. Under a roof, all plants have a “watering pot”. That is the top part of a plastic flower pot. It eases watering the plants; water drops in the soil towards the roots near the stem. When pouring water on dry sand under the roof, water will not drop in the soil but it will spread over the dry sand. And only little water will drop near the roots. I have added this info to the page. Hey there sjefgardentips.wordpress.com, this is Gary from PlantCareToday.com. I’m emailing you today because we just updated our article on growing orchids indoors. Did you know that according to the USDA 2015 Floriculture Crops Summary, orchids topped the “Potted Flowering Plants Sold for Indoor or Patio Use” category with $288 million in value? That’s a lot of flowers! It might make a great addition and resource to your page.